"It's strange, isn't it? Each man's life touches so many other lives. When he isn't around he leaves an awful hole, doesn't he?" A giant died on Monday. His name was Gerald Pratley. Gerald was 87 years old. Though he wasn't a household name, it's no exaggeration that anyone in Canada who TRULY cared about cinema, knew or knew of this titan who devoted every fibre of his being to the study and appreciation of that great gift to mankind - the movies. Gerald Pratley was a critic, author, teacher, historian, programmer and founder of the Ontario Film Institute - twenty years of curating, screening and archiving film history that was extended and preserved as the Ontario Cinematheque, a year-long stomping grounds for movie nuts in Toronto and most importantly, with the support of the Toronto International Film Festival (TIFF), Pratley's vision morphed into the TIFF Lightbox. As Clarence Oddbody pointed out to George Bailey in It's a Wonderful Life, "Each man's life touches so many other lives. When he isn't around he leaves an awful hole..."
Without Gerald Pratley there would have been no Cinematheque and no Lightbox. It's especially shameful and ultimately to the loss of both the Toronto International Film Festival and its followers that Gerald's important place in cinema (and that organization) was relegated to a buried acknowledgment in their staff/contributor listings and that he was never given a proper venue within the organization to share his wealth of knowledge with movie lovers. Gerald's myriad of accomplishments in the world of cinema rival in number and importance the number of "begats" in the Book of Genesis. Why shouldn't they? Cinema is a temple - all seeing, all showing, all holy - and Gerald Pratley was one of cinema's High Priests. Though He is no longer with us in a physical form, Gerald continues to touch us all. He continues to touch those who had the honour of making his acquaintance and with equal force, he will touch so many others who never met him (as well as those who might not have even heard of him). He most certainly touched my life and perhaps, through my personal experience and respect for him, he will touch others. In fact, I hope all who knew him will spread his love. And it was a special love. Gerald loved movies and this love was infectious. His was the business of making the adoration of cinema spread like some pathogenic agent. While for some, the unconditional, obsessive love of cinema may seem like an "abnormal" condition, I think most of us who have been touched by the magic of movies will happily take aberrance over "normal" anytime. And of course, Gerald loved the company of those who loved movies. His devotion to ensuring that movies in all their splendour could be seen and revered not just as mere baubles, distractions and ephemera was equalled by very few. Movies - GREAT movies - were meant to last forever and Gerald used every means at his disposal to make this a reality. I had known of Gerald and his work for many years (that part of life when movies mattered more than most anything) and while I admired him from afar, I never dared approach him for fear of imposing myself on someone I so revered. This was, of course, typically Canadian of me. When I was finally introduced to Gerald in 1994 at the Montreal World Film Festival, I realized I was clearly in the presence of a force exuding an unbridled level of love and appreciation of movies, but he did so with such humility and warmth, that I simply wanted to kick myself in the head for not making his acquaintance at an earlier juncture. Over the years, I continued to see Gerald at film festivals and various industry functions. The level of discourse was always a treat and I fell in awe with his knowledge of cinema history and critical acumen. I fondly recall an evening at the Berlin Film Festival in 1995 where we shared a ride to a party for Patricia Rozema's "When Night is Falling". I think everybody was in the mood to celebrate Rozema's magnificent achievement, but upon arriving in East Berlin, the thump-thump-thump of the house music inside the lesbian dance club was so shuddering, so deafening, so - dare I say it? - uninviting, that a whole group of us stood outside in the freezing cold for a long time. Accompanying me in the frigid Berlin clime was Cynthia Roberts (the director of the film I had produced called "The Last Supper", also being honoured in Berlin that year), the late Jim Murphy (a veteran film distributor and, at the time, a promoter of Canadian cinema through an agency of the Ontario Ministry of Culture), Risa Shuman (the legendary producer of the long-running film appreciation series "Saturday Night at the Movies" on TV Ontario) and, of course, Gerald. We all (like good Canadians who knew very well how to weather sub-zero temperatures) stamped our feet, blew into our freezing cupped hands and talked about movies - anything but enter that club of ear-splitting dance music. Soon, however, it was Gerald who donned the bravest face I think I'd ever seen and it was he who led the way into that dark den of fierce party hounds. This was a Canadian celebration for a Canadian film from a Canadian director we all loved and admired. What else could one do, but follow the Leader? Our Leader, once ensconced within the cove of celebratory depravity, made an immediate beeline for one of the many silver-painted waitresses to imbibe in a bit of cheer. About ten days prior to Gerald's passing, I journeyed from Toronto to the Pickering Flea Market to visit Michel Harmouche's astounding DVD Wave stand and while perusing stacks upon stacks of movies, I caught myself having imaginary conversations in my head with the aforementioned late and great Jim Murphy. It was uncanny. I was genuinely having a conversation with my old pal who came with me every Saturday for years to buy movies here. Very pleasantly, my thoughts that day in Pickering turned to Gerald and in almost photographic detail, I remembered a Saturday morning several years ago in which Jim convinced Mr. Pratley to join us on one of our pilgrimages to this temple of boundless, superbly priced home entertainment product. Gerald's eyes widened to saucer-like proportions upon his inaugural gander at the ocean of movies in Michel's stand and soon yielded the kind of magic I seem to only experience with friends and colleagues who share my pathological love of movies. Gerald dove into the infinitesimal chasm of DVDs and immediately fished out a title which, he promptly handed to me. On the car ride to Pickering - Gerald in the front passenger side and Jim in the middle of the rear seat - one of the many movie-related subjects included the work of director Robert Aldrich. Of course we jawed enthusiastically about the crime and action pictures he made like "Kiss Me Deadly" and "The Dirty Dozen", but when the topic turned to Aldrich's penchant for overripe melodrama, I lit-up like a bank of footlights and Gerald proceeded to wax ever-so eloquently on Aldrich's harridan hag oeuvre which, of course, included such taste treats as Whatever Happened to Baby Jane and Hush, Hush Sweet Charlotte. This direction in the conversation pleased me to no end - I was (and still am) a sucker for hags (and babes) slugging it out in psychological and/or literal movie cat fights. When Gerald asked my opinion of a certain Aldrich fraulein-freak-show and I ashamedly had to admit I'd never seen it, the resulting magic at DVD Wave was indeed Gerald plucking right out of that bin none other than Aldrich's The Killing of Sister George. How I'd managed not to even see the movie is one thing, but to have not found a DVD copy of it after a few years of diving into Michel's stock is (and indeed was) beyond me. When I heard about Gerald's death, I couldn't stop thinking about my imaginary conversation with Jim Murphy in Pickering ten days earlier and how THAT inspired me to think about the long-ago halcyon journey to the same hamlet of all-bargains-cinematical. Damn! I even remember thinking - whilst I was there ten days ago: "Hey, Gerald lives in Belleville. That's not too far from here. It's been too long. Maybe I should just hop in the car and make the trek." And now I wonder if I'll be constructing similar imaginary conversations in my head with Gerald. The ones I had with Jim certainly seemed very real, so maybe, at some point something will tweak me and I'll be sitting in Belleville with Gerald Pratley talking about movies. One can, I suppose, chalk up the idea of such imaginary conversations enveloped in a tangible clarity as being the direct result of mental illness and/or an overactive imagination. But you know, dismissing the reality of imagination takes NO imagination - none at all! Movies are dreams and dreams fuel us. It's dreams and imagination that fuel filmmakers to deliver all those endless pieces of time. It's dreams and imagination that keep the spirits of those we hold dear alive forever. And they are alive, but to keep them living, we must always keep their spirits within us. Their spirits must course through our dreams and imagination. They have, after all, touched so many other lives and can continue to do so through US. That day with Gerald and Jim in Pickering will always stay with me. The excitement of unwrapping The Killing of Sister George and feeling that delectable gooseflesh of joy as I watched it courses through me even now. I want to relive that Saturday sojourn again and again. That day and everyday that followed was touched by Gerald's presence. Just like the inimitable Gerald Pratley. So beautifully written from the heart.Tears are flooding the keyboard.Thank you. Truly a wonderful piece,kudos to you.It seems Mr. Pratley was a believer in the magic of movies and spent his life sharing that magic with others.People like that never die,they live on through the lives of those they've shared the magic with. Lovely and touching, Greg. I shared your youthful experiences with and attitude towards Mr. Pratley, so the writing brought them back in force. Thanks. He will be missed. In the 60s, Gerald Pratly, Aldo Maggiorotti, and Elwood Glover teamed up to form the AGE Film Society in the days when we had no access to classics any other way. Gerald and his friends were responsible for so many of us who went on to have a life or career in film. Just another small event in his life, with so much result. Thank you for the wonderful thoughts about my brother and the man he considered a giant in your industry. I just caught up with your blog entry now and want to say thanks for a lovely tribute to one of the giants of the industry. I knew Gerald and spent several evenings in his company (along with the late great Star/Telegram critic Clyde Gilmour). Watching The Maltese Falcon on TV in their company was an evening I will always remember. 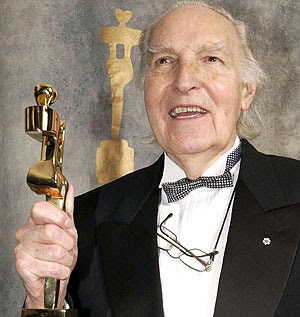 Gerald probably did more for the Canadian film industry than anyone else - not a bad legacy!